Our Science Laboratory Thermometers are easy to use and offer dependable and precise temperature readings for lab procedures and experiments. We offer full and partial immersion thermometers, as well as products with eco-friendly alternatives to mercury for safer, cleaner lab use. 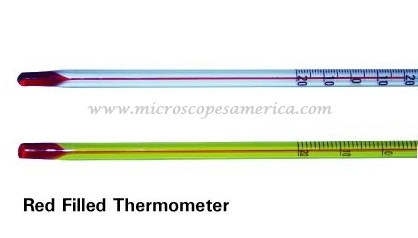 Stock up on Lab Thermometers for your school or professional science laboratory for increased precision and accuracy in conducting your lab work and experiments. • 97-3107: Measuring Range: (-20° to 150°C x 1°); 12" long; Color white.